Daily haul-ins are welcome for a $15.00 per day per horse and rider fee. Additional horses for the same rider are an add'l $5.00. Monthly passes are available for 100.00 and run from the first through the last day of the month. Everyone needs to sign a liability waiver before unloading a horse. NO EXCEPTIONS. Waivers are on a clipboard in the tack room. Our insurance company asks us how many haul-ins we have annually and charges extra premiums to us because haul-ins are a liability risk. This is because even a horse that is just tied to his owner's trailer, then ridden down our driveway to the trails could hurt himself, you or others. 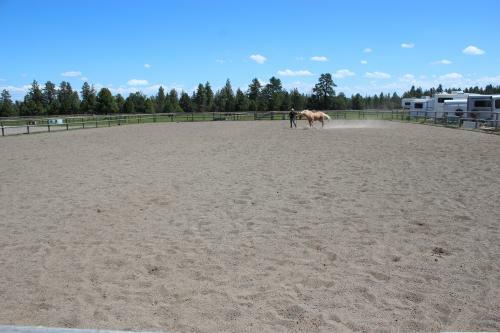 In addition, haul-in horses have been known to chew on our arena, hitching posts and fences. They have dug halfway to China in our bark. They have gotten hurt while visiting us and we have doctored them up. Sometimes they leave poop behind or dirty shavings from their trailers. Their owners use our port-a-potties and sometimes forget to turn off the lights in the barn. Hey, we're all human (or equine), and these things just happen sometimes. But we allow for these, and pay for the extra lights, hot water, labor and liability insurance by charging a $15.00 haul-in fee per horse. We love our customers and their horses and want to keep doing what we're doing, so charging fifteen bucks is the bare minimum to keep keepin' on. Sorry, but no dogs allowed, and please refer to policies for additional "rules of the ranch". And after all that verbage....we look forward to meeting you and your horse and actually riding! Daily haul-ins are welcome for a $15.00 per day per horse and rider fee. Additional horses for the same rider are an add'l $5.00.